Fifty years ago today, a nuclear-armed B-52 stratofortress bomber was flying an alert mission over Greenland (well after America’s overtures to purchase the world’s largest island) and experienced a cabin fire that prompted six out of seven crew members to safely jettison and abandon the aircraft and its payload of four hydrogen bombs before it could reach the landing field at Thule. The craft went down in the icy North Star Bay and the ensuing explosion of the fuselage and the conventional munitions on board caused the nuclear shells to rupture and contaminate the wider Bay of Baffin. The US and Denmark launched a massive containment and recovery effort that cost the equivalent of a billion dollars and one warhead was never recovered and the country’s tacit support of the deterrence exercises that kept twelve of such bombers aloft at all times (the US Strategic Air Command’s Chrome Dome) on the periphery of Soviet airspace was in direct violation of Denmark’s official anti-nuclear stance. 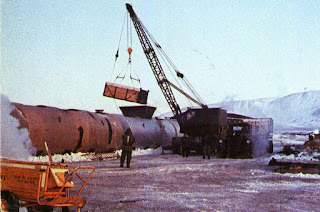 Responders worked quickly to remove radioactive ice before the summer thaw that would have caused an even larger area to be impacted and hauled away tonnes of ice and debris during the extreme arctic winter in what was deemed officially Project Crested Ice (our faithful chronicler Doctor Caligari links to some news reel footage) but referred to by workers—many of whom later suffered radiation sickness—as Dr Freezelove in homage to the 1964 Stanley Kubrick release.